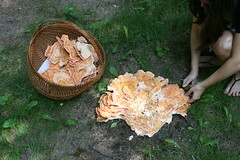 During August of 2010 I was enjoying some time in Minnesota with my aunt and got into talking about local wild mushrooms. 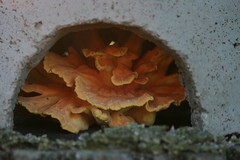 She told me about the chicken of the woods – how unmistakable it is with its shelf-like structure, no stems, no gills and bright orange color. 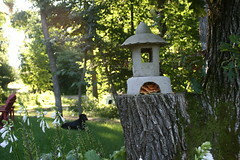 The very next day while we were enjoying a picnic dinner in her front lawn I spotted one growing right by her garden on a sawed-off portion of a big oak tree! 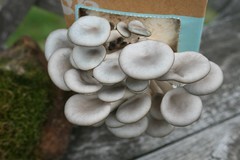 Over the winter down in Missouri I grew my own oyster mushrooms which turned out GREAT. 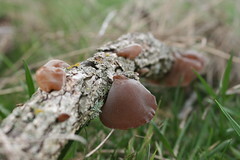 Then in the spring I found jelly ear mushrooms in the wild, at their peak of being jelly-like, and ate some for the first time. 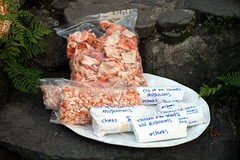 They were more of a texture than a flavor but I would eat them again. Any way you slice it (ha!) 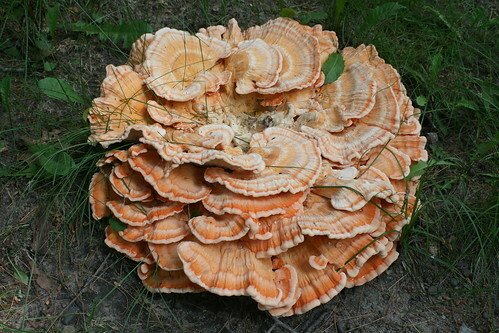 the chicken of the woods mushroom is a superior mushroom. Ever since finding the one at my aunt’s house in 2010 I have been looking for more. 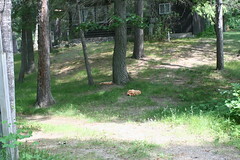 It wasn’t until a couple of weeks ago in Nisswa, Minnesota that luck struck me and I found more — Much, much more! It was growing on the roots of a living oak tree. There was a lot of dirt and grass incorporated into it so I spent many hours meticulously cleaning what I wanted to keep. I had a couple friends to help too but eventually everybody petered out and thought I was nuts. Then I cooked some and they understood! Doesn’t it look a lot like chicken? 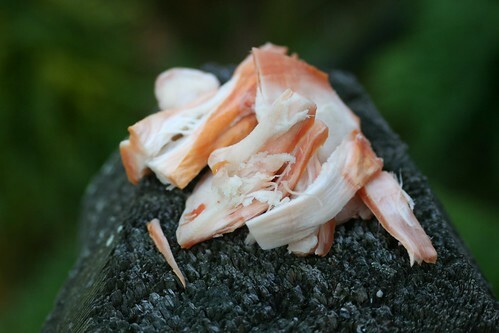 The fibers run in strands like muscle tissue and stay that way after cooking, the coloring is similar to white meat or seafood and even the amount of moisture in the mushroom is similar to meat. Since I no longer make chicken a reoccurring item in my diet it’s hard for me to say “it tastes like chicken too”. To me, it has it’s own flavor which is hard to describe but very, very wonderful and I would say “different” than other typical cap/stem mushrooms. 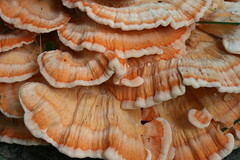 I cleaned, ate and froze the remainder of over 6 POUNDS of Chicken of the Woods. 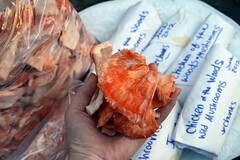 I’ll be sure to share some recipes soon, as these mushrooms are not to be eaten raw. So far I have sauteed them, added them to a chimichanga, and made them into a veggie burger. I think a creamy white sauce over pasta and spinach sounds good, along with marinating them before grilling, and I can’t forget… making “chicken nuggets” by breading and frying them!